I did buy a book this week, but let me explain. I’ve decided that there has to be one exception to my non-book-buying rule and it’s this: I really can’t go to a book launch and not buy a book. It just wouldn’t feel right. And to turn down an invitation to a book launch because I’m not buying books would be going too far. And my dear writer friend Sue Hepworth (see her blog at Suehepworth.com), who has been keeping an eye on me, says it’s Ok. She’s given me permission. 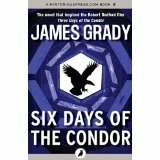 The occasion this week was the launch of James Brady’s Last Days of the Condor, a follow-up to his novel, Six Days of the Condor (filmed as the splendid Three Days of the Condor, starring Robert Redford). I’ll be blogging next week about James and the new book. Meanwhile, more thoughts on not buying books. The saving of time and mental energy – not to mention money – is considerable. It has saved me from making decisions. I don’t have to loiter in bookshops, my finger doesn’t hover over the one-click button. I make a note of something I want to read and then I pass on. In theory. I did linger over Daniel Levitin’s The Organised Mind in Hatchard’s on St Pancras Station. I really wanted that book. But it is all about deferred gratification and I walked out without it. I will read it, but not yet. Charity shops are the worst from every point of view. I might see something that is out of print and that I have wanted for ages. And they are so cheap. Best not to look, even though I am going in to donate bags of books. Yes, as well as not buying books, I am actually getting rid of some. Many are ones I bought from charity shops on a whim. Now I am reading the first few chapters and if it doesn’t grab me, it goes in the bag for the charity shop. The thing to do is to note the name of the tempting book and then get it out of the library. Anything to keep our lovely libraries open! And if they haven’t got it, ask them to get it. Thank you, Sheila. Yes, such a good idea to keep using our libraries, otherwise they will just disappear. Well done, Chrissie! How much longer do you have to go? I can’t recall. Quite a way to go yet. Until 24th December!